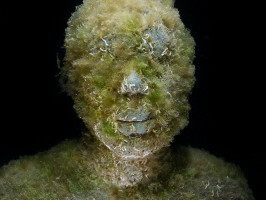 Go down into the depths of the marinas to see up close Jason deCaires Taylor’s sculptures in the first underwater contemporary art museum in Europe. 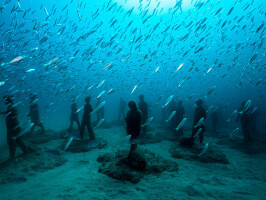 Dive into the depths of Lanzarote’s waters and visit the Atlantic Museum, a spectacular artificial reef made up of a collection of sculptures that create a strong visual dialogue between art and nature. 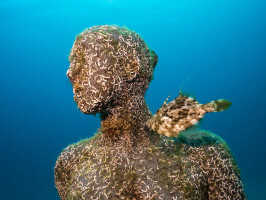 Located on the Lanzarote coast and at 14 metres deeps, this museum project occupies 50 by 50 metres of seabed and boasts over 300 sculptures displaying various scenarios. 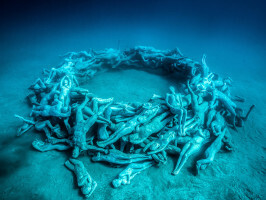 Admire the “Human Swirl”, 200 figurative pieces placed in a circular shape; “The Portal”, that reflects the ocean surface or “The Hybrid Garden” among other compositions. All the pieces are made out of pH neutral materials and are designed to adapt to the sea life endemic. So much so that they are already frequented by sharks, batteries of barracudas and sardines, octopuses, sea sponges and sting rays. 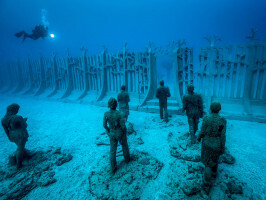 Atlantic Museum Dive: Includes one “Open Water” dive in the Playa Blanca area and one in the museum. Open Water Course + Atlantic Museum – 3 days: Get the correct certification in order to be able to visit the Atlantic Museum. On this 3 day course you will have 2 beginner dives in learner areas (Costa Teguise or Puerto del Carmen) and ending the experience with 2 dives in the museum in the Playa Blanca area. Companion: If you select this option, you will be able to accompany the diver up until the Playa Blanca area, where you can enjoy free time. Only one companion is permitted per diver. Includes transfers from the hotel, instructors, diving equipment, transport by boat, 2 dives, tickets to the museum, authorization to take photos under water, an appetizer and boat transfers to second diving area. Open Water Dive: between 20 and 45 minutes. Open Water Course + Atlantic Museum: 3 days. Explanations and dives: approximately 45 minutes. Spanish, English, German, French, Italian, Dutch, Portuguese, Catalan and Polish. Pick-up from hotels in Costa Teguise, Arrecife, Puerto del Carmen and Puerto Calero at 8:30am and from Playa Blanca at 9am. The companion will not be able to board the boat. Remember to bring sun cream, a towel and some warm clothing. Duration: Atlantic Museum Dive: This excursion takes 6 hours (45 minutes of diving.) Open Water Dive: between 20 and 45 minutes. Open Water Course + Atlantic Museum: 3 days. Explanations and dives: approximately 45 minutes.